One of the major issues associated with Nuclear Power is minimizing outage time. The outage hatch was designed to enable quick passage of personnel and equipment without having to remove and reinstall the permanent equipment hatch cover. 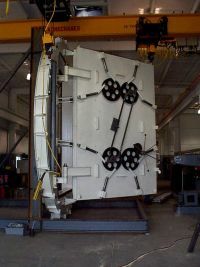 During a refueling outage, the equipment hatch cover is removed and reinstalled numerous times to facilitate egress and ingress into the reactor building. This can be a lengthy and arduous process, particularly if the existing outage hatch needs repairs and/or upgrades. 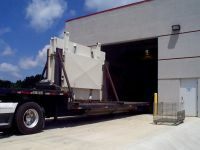 Curtiss-Wright Nuclear provides engineered Trentec Containment Hatches in all shapes and sizes complete with cover and matching body ring – which can be furnished with all necessary hoisting and handling equipment. Whenever possible, Trentec Hatches are equipped with swing-bolt closures to allow rapid assembly and disassembly. Trentec Hatches are also incorporated with double O-ring seals with a test connection between seals, allowing periodic leak testing. Trentec Hatches, support services, and replacement parts are custom designed to meet each utility’s technical requirements. 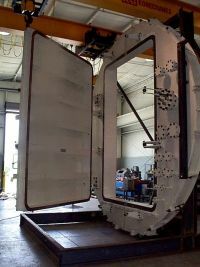 Assembly, disassembly, and storage of the containment hatch can be performed inside the containment building if necessary. Three-piece construction enables movement of the hatch through the existing containment hatch opening. Three-piece construction includes two bulkhead sections and one large door section. The Trentec Outage Hatch Bulkhead is designed to match the current hatch cover fastener locations; by utilizing preexisting hatch swing bolts, efficient dismantling and procedural access times are kept to a minimum. It is highly recommend that the utility evaluate the benefits of utilizing this equipment for future outage seasons. EGS Electrical Penetrations Assemblies (EPA’s) are equipped in the bulkhead allowing electric, air, and other resources to pass from outside containment to inside containment. The number, size, and configuration of EPA’s can be custom designed to meet all install specifications. Manual and automatic open/close features are available. Compression or inflatable seals are also available. Seals require routine replacement, which can be installed by the Trentec field services team. 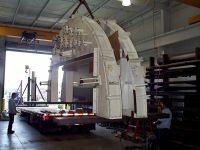 Equipment and outage hatch replacement parts can be procured by Curtiss-Wright Nuclear, regardless of OEM.